MyPCBackup is a newer online backup service, at least in the United States. They are based in the UK, but do have server centers in the U.S. as well as other global locations. MyPCBackup is positioned in a segment of the market that many others have abandoned – that of unlimited backup for a fixed fee. For that fee, you really get just online backup; other features are available but are offered as upgrades. For the individual Windows PC (and now Mac) owner with lots of data to backup, MyPCBackup makes a great deal of sense, especially if you take advantage of the steep discounts for prepaying on a 1 or 2 year basis. Yet they also offer even LESS EXPENSIVE plans if you don’t have that much data to backup. So you do not have to pay for unlimited online backup unless you need that much storage. On the Microsoft platform, MyPCBackup is only available for Windows workstations. Windows SERVERS are currently NOT supported. Getting started with MyPCBackup is very easy; simply sign up for either a 14 day free trial account or a paid unlimited account. Then download and install the software. You will need the username and password information when you created the account, typically the username is the email address you signed up with. The installation process is very simple and straightforward and will have you backing up your files in no time. There are, however, some default settings that you may want to change. 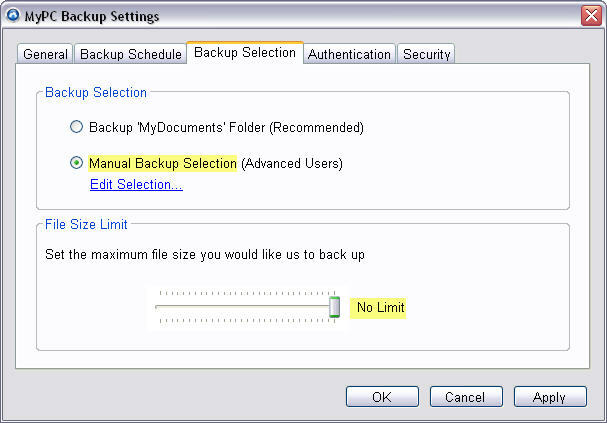 The first backup setting you need to be aware of is the backup set. 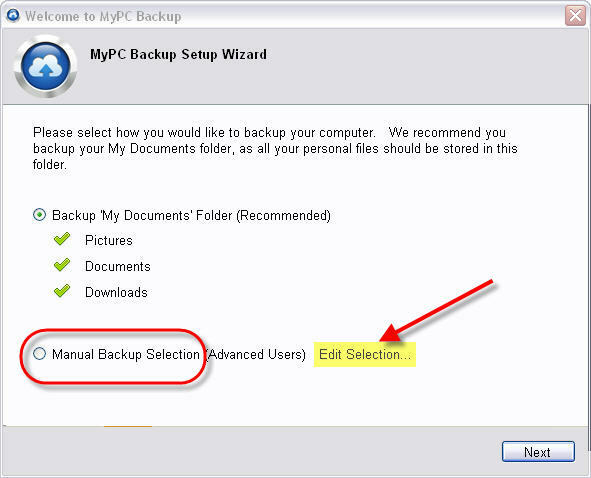 By default MyPCBackup will backup files in your My Documents folders but not such items as favorites. If you do NOT have your important data in that location you want to select “Manual Backup” and edit that set marking every directory you have data in. If you are unsure where your data is, now is the time to find out! Next, here is a screen shot of the backup settings that can be changed anytime by clicking the “backup settings” button on the MyPCBackup application. The default file size limit is 5MB, meaning that any file over 5MB in size would not be backed up! That means most of your higher quality songs and all of your video files would be skipped; not good. For me, I moved the slider all the way over to the right so that there is no limit on the size of files backed up. If I have a directory/folder location checked, I want everything in that folder backed up. The only caveat to that may be that in order to get the quickest start you may want to allow the program to complete a backup or two with the default and then move the slider over in 1 or more increments as larger files will take a substantial amount of time to upload, depending on the speed of your internet service. That’s really about all there is to configure. By default, your computer will backup once daily, at an unspecified time. If you want hourly backup protection that is available for an upgrade fee. You can manually backup at any time also with the “Start Backup” button on the applications main screen. MyPCBackup does support external USB hard drives as a source for files to be backed up. It does not, though, support network or “mapped” drives as is typical of most home online backup services. There is no local backup to external USB hard drives, though. The Sync folder is a feature that comes with the basic paid online backup plan, although to actually sync multiple computers you will need to purchase a license for the additional computer(s) you wish to sync with the primary backed up PC. Anything files that you put into the Sync folder are synchronized immediately, regardless of whether you have the default daily backup option or the upgraded hourly backup option. The standard Sync folder is 100MB in size, but likely may be 1GB by the time you read this. Previously, for an upgrade fee, this can be increased to 20GB. Update: After a few weeks of using the service we received a notification that our Sync Folder had been upgraded, at no cost, to 1 Gigabyte of space! The whole purpose of online backup is to be able to restore the files should you need to. Restoring files is pretty straightforward and can be done one of two ways. First is the main application on the computer you are backing up. Select “Restore Files” from the main menu and the Restore Wizard will open up a menu tree that allows you to select a folder where the folder was backed up from. The second option is to restore from the website. This option is one that can be performed from any computer, anywhere, with an internet connection. No special software needs to be installed on the computer in order to download files. One feature that would be nice is to be able to search for a file in case you don’t really know for sure where it was – or you just hope it might have been somewhere! On my Android phone the website allowed me to paste in my email address, but not my password. I’m sorry, but I just don’t have the patience to type in a 20 character complex password that is sitting in the paste buffer when a site won’t accept it. According to tech support, they are working on both iPhone/iPad and Android apps, but we are still waiting. Hopefully those apps will be out soon and impress. MyPCBackup is one of the few companies these days that actually publish a phone number at all, let alone for telephone tech support. Queue times can be of any length, but, alas, they offer a paid upgrade to “jump” to the front of tech support queues. One day we spent 30 minutes on hold before giving up (non-paid-upgrade), although at any time one could leave a message. A few days later we called at 11am Central Time and had a knowledgeable, British accented gentleman on the phone answering our questions. He did put us briefly on hold once to inquire of a colleague for an answer. Tech Support staff was tripled since then we were told. Email support is also an option, through the website. Our attempt to contact support this way, so far, no response after 2 weeks. We brought up to support and were told that a problem had existed in the system that they believed to be fixed. One may also send an email to support straight from your computer, which we recommend, so that you have a copy in your sent items folder. Our direct email to support was answered promptly. MyPCBackup has a lot going for it if you have lots of data to backup and don’t want to have to worry about quotas and going over your plan limit. Prepay for 2 years and you get unlimited backup cheaper than anywhere else. Functions are fairly limited, though, but upgrades are available. While some may feel like they are being asked to pay for every feature separately, the upside is that you only pay for what you need and unlimited backup can be had quite reasonably. Limited plans (with very HIGH storage limits) are also available at even lower prices.